Now all things are filled with light; heaven and earth, and the nethermost parts of the earth… Christ is Risen! Children of God! From a fullness of unearthly joy I greet you with words full of Divine power: “Christ is Risen!” The holy fire of this salvific tiding has burst anew with bright flames over the Lord’s Tomb, and has spread throughout the world. Beloved in Christ brethren and sisters, my friends! 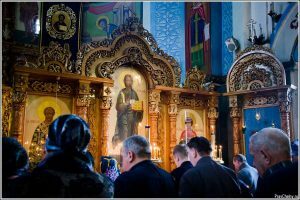 You of course will have noticed that, of all our great and joyful Christian feasts, the feast of the Luminous Resurrection of Christ is characterized by a special solemnity, a special joy: it is the feast of feasts and the festival of festivals! 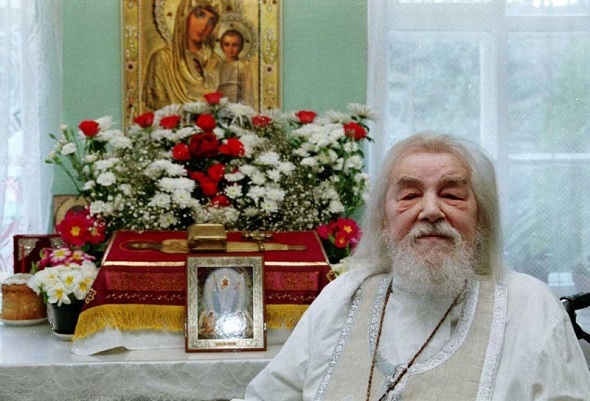 No service in our Orthodox Church is more magnificent, more heartfelt, than Paschal Matins. Therefore all the faithful rush to God’s church on the Paschal night. Indeed, the Paschal Divine service resembles a magnificent banquet prepared by the Lord for all those who stream under the grace-filled protection of His House. Contemplate the contents of St John Chrysostom’s “catechetical homily”! With paternal tenderness and cordiality the Lord accepts those who love Him with all their being. “Blessed is he who has wrought from the first hour” – these are those who from their youth undeviatingly follow His Divine steps. Undoubtedly all who were in church on the Paschal night experienced an unusual delight… Our souls rejoiced, filled with a sense of gratitude to our Lord and Savior for the eternal life He has given us all. Indeed, Christ’s Resurrection raised the human race from earth to Heaven, giving an elevated and noble meaning to human existence. The human soul yearns for the eternal life of joy. It seeks it… Therefore people rush to the luminous Matins in God’s church. And not only the faithful, but even those whose consciousness is from the Christian religion. They come here not simply to look at the solemnity of the Christian service. Their souls, given by God to everyone at birth, are attracted to the light of the inextinguishable Sun of Truth, seeking the truth. Faithful people on this holy night feel an abundant outpouring of the luminous joy of Christ’s Resurrection with particular power. And no wonder! Christ’s Resurrection is the foundation of our faith, the inviolable pillar of our earthly life. By His Resurrection, Christ has given to people to comprehend the truth of His Divinity, the truth of His elevated teaching, the salvific nature of His death. Christ’s Resurrection is the completion of His earthly deed [podvig]. There could not have been any other end, for this was the direct consequence of the moral sense of Christ’s life. If Christ be not risen, the Apostle Paul writes, then our preaching is in vain and our faith is futile. But Christ is risen, and He has raised all mankind with Him! In His prayer before His suffering on the Cross, He asked His Heavenly Father for the gift of this great joy for people: Sanctify them by Thy truth… that they might have My joy fulfilled in themselves (John 17:17, 13). Through the Resurrection of Christ, a new world of holiness and true blessedness has been opened unto man. During His earthly life the Savior repeatedly pronounced words that are precious to the faithful soul: Because I live, ye shall live also (John 14:19); My peace I give unto you (John 14:27); These things have I spoken unto you, that My joy might remain in you, and that your joy might be full (John 15:11). The Apostle Paul, in his Epistle to the Romans, writes: For if we have been planted together in the likeness of His death, we shall be also in the likeness of His resurrection… Now if we be dead with Christ, we believe that we shall also live with him (Rom 6:5, 8). A new life has been opened unto man. He has been given the possibility to die to sin in order to be raised with Christ and live with Him. “A Pascha that hath opened the gates of Paradise to us,” we sing in the Paschal canon. There is no joy, my beloved, more luminous than our Paschal joy. For we rejoice that, in the Resurrection, our eternal life has been opened unto us. Our Paschal joy is joy for the transfiguration (change) of our life into an incorrupt life, in our aspiration for imperishable good, an incorruptible beauty. We now celebrate the greatest mystery, the Resurrection of Christ, the defeat of the Life-giver over death! Our Savior triumphed over evil and darkness, and therefore the Paschal Divine service of our Orthodox Church is so jubilant and joyful. The faithful awaited this solemn service, preparing themselves for it during the long weeks of the Holy Forty Days. It is natural that their hearts are now filled with inexpressible joy. The deepest meaning of Christ’s Resurrection is in the eternal life that He gave to all His followers. For 2000 years already His followers have unwaveringly believed not only that Christ arose, but in their own coming resurrection to eternal life. Christ the Savior spoke many times during His earthly life about Himself as the bearer of life and resurrection. But then these words of the Divine Teacher were incomprehensible not only to the people who listened to Him, but even to His disciples and apostles. The meaning of these words became clear only after Christ’s Resurrection. Only then did His apostles and disciples understand that He is, indeed, the Lord of life and the Conqueror of death. And then they went to preach throughout the entire world. We, beloved, great each other during these joyful days with the words “Christ is Risen!” We will continue to greet one another in this way for the course of forty days, until the day of the Lord’s Ascension. Just two words! But these are marvelous words, expressing unwavering faith, which gives joy to the human heart, in the truth of our immortality. He many times spoke of Himself as the bearer of life and resurrection, as the source of eternal life, which is without end for those who believe in Him. Christ is Risen! – and may our souls rejoice in the Lord. Christ is Risen! – and may our fear of death vanish. Christ is Risen! – and our hearts are filled with the joyful faith that we, too, will rise with Him. 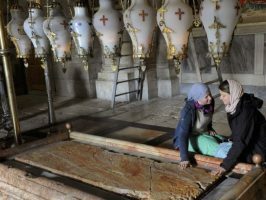 To celebrate Pascha – this means to know with all one’s heart the power and grandeur of Christ’s Resurrection. To celebrate Pascha – this means to become a new person. 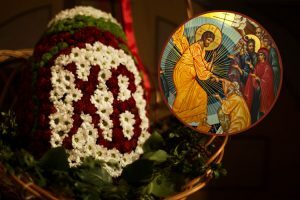 To celebrate Pascha – this means with all one’s heart and mind to thank and glorify God for His ineffable gift, the gift of resurrection and love. In these days we all exult and joyfully celebrate, praising and glorifying the deed [podvig] of the triumph of Divine love. Let us throw open our hearts to meet Him Who suffered, and died, and arose for our sake. He will enter and fill our life with Himself and His Light, transfiguring our souls. We answer this by striving towards Him along our way of the Cross, for at its end, there is no doubt, shines our own resurrection to life eternal.